Best known as a Cardinals GM, architect of the 1964 World Champion Cardinals, former Mets President Bing Devine died today at age 90. From 1965-67, Devine was assistant to the president, and then president of the New York Mets, during which time he convinced top brass to post the necessary $53,500 to sign Tom Seaver. An excellent synopsis of Devine's Mets tenure, by Jon of Mets By The Numbers, can be found here. In other transplanted ex-Mets news, Karim Garcia has signed a minor league contract with the Phillies. Garcia spent the first half of the 2004 season with the Mets before being traded to the Orioles for Mike DeJean. Garcia is probably best known for, while as a Yankee, beating up a Boston Red Sox groundskeeper in the Fenway Park bullpen during the 2003 ALCS. This did not deter Jim Duquette from signing him before the 2004 season. After signing with the Mets, Garcia and Shane Spencer were accused of starting a fight in the parking lot of a pizzeria in Port St. Lucie during Spring Training in 2004. The fight allegedly began when began when Garcia was asked not to urinate in the parking lot after a birthday celebration for his wife. Garcia spent 2005 and 2006 playing in Japan for the Orix Buffaloes. Former Mets pitcher Nolan Ryan, 59, was hospitalized Friday for treatment of recurring symptoms of an existing medical condition, discovered when he had double-bypass heart surgery in 2000 according to his son, Reid Ryan. Nolan's son declined to specify the condition but said it was not an emergency. "He's feeling good," Reid Ryan said, "This is more about taking precautions." Nolan Ryan is in the Hall Of Fame, with 27 years in the big leagues, amassing 5,714 career strikeouts. Ryan was drafted by the Mets and spent 5 years with the team, and had 14 games where he threw double digits in K's. But at 23 years old, young Nolan Ryan was traded in 1971 to the California Angels for Jim Fregosi, offically cursing the Mets with "The Nolan Ryan Curse." Nolan Ryan would go on to throw seven no-hitters over the course of his career, while the Mets as a team have never have a pitcher throw a no-hitter in their 45 year history. According to a team press release, the Mets have signed 36 year old righthander Aaron Sele to a minor league deal. Sele is a 14 year veteran who pitched to a 8-6 record with a 4.53 ERA in 28 appearances for the Dodgers in 2006. Although Sele made 13 relief appearances last season (27 hits in 19 innings), the Mets presumably signed Sele to compete for a spot in the starting rotation. As a starter in 2006, Sele was 7-5 with a 4.18 ERA in 15 starts. Sele had one very good month last year, May, when he went 3-0 with a 2.20 ERA in 5 starts. Overall on the year, opposing batters hit .290 off Sele (.280 as a starter). Sele has a lifetime 145-110 record with a 4.59 ERA. Twice an All-Star, Sele was one of the game's top pitchers from 1997 - 2001, posting an 82-47 record, until shoulder problems started to sideline him in 2002. From 2002 - 2006 he's 38-42, but obviously, this is one of those low-risk cases where the Mets are hoping to get lucky. LF Cliff Floyd - As Matt Cerrone wrote today, Cliff had just one truly solid year for the Mets, and struck out a ton, but his attitude and charisma embodied everything we love about the Mets. Kevin McReynolds may be the most successful Mets leftfielder of the last twenty years, but he can't match Cliff Floyd's personality. If I were old enough to see Cleon Jones, I might have picked him. RF Darryl Strawberry - Strawberry was the first player to inspire me to show up at Shea with a sign. I don't remember how old I was, but I recall it was a small sign encouraging him to hit a home run. Darryl doesn't have much competition for favorite Mets right fielder, though I loved watching Derek Bell the first half of 2000. Sheesh. CF Mookie Wilson - The Mets have had some great center fielders who I loved to watch, Lenny Dykstra, Carlos Beltran, even Melvin Mora and Lance Johnson, but there really is no contest here. Mookie didn't put up the gaudiest stats, but he was electric to watch, had a terrific personality, and such an awesome name that I named my dog after the guy. Remember this is a "favorite" list, not a "best of" list, although it should be noted Mookie holds the position for most games played in center for the Mets. So, that's saying something. Carlos Beltran has the potential to become the "greatest" center fielder of all time, but he'll never be as popular as Mookie. Just think, Mookie's legacy is Game 6, a game that needs no further identification, while to this point, Beltran's Mets legacy is... well, let's not write about that here. By the way, another Mets centerfielder of note is Darryl Boston, who greatly resembled the police sketch artist's drawing of the Zodiac Killer. 3B Howard Johnson - When I was in junior high, we had to take a Home Economics class where we learned stuff like cooking and sewing. I made a pillow shaped like a baseball with the word "HoJo" on it. I also got my only detention sentence of my junior high tenure during this class for starting a marshmallow fight while learning to make Rice Krispy treats. Robin Ventura was a great, popular Mets 3rd baseman, and David Wright is well on his way to be the most popular Met of all time, but HoJo is the man. 2B Edgardo Alfonzo - Can you believe Fonzie beats out Matsui for this spot? Fonzie is one of my favorite Mets of all time. A team-first player, he moved around the infield to play third, short, and second, depending on the Mets needs at the time. All the moving around probably cost him a gold glove and some fame, but he never complained. Derek Jeter called Alfonzo the star of the team, despite all the accolades given to Mike Piazza. Tom Seaver called him the best player in baseball at the #2 position in the batting order. He kind of fell off a cliff when he signed with the Giants, but he was a great Met for his eight years in New York. By the way, Jose Vizcaino gets an honorable mention, despite his postseason heroics against the Mets, for the sole reason that one time he threw a ball into the stands that I caught. C Mike Piazza - Is there a team with a better legacy behind the plate than the Mets? Perhaps, but Gary Carter, Todd Hundley and Mike Piazza is quite a trio of backstops for one team in a twenty year span. Mike Piazza gets the nod here over Carter for me just because of the sheer number of heroics. He was a classy guy, getting far too much abuse over not moving to first base soon enough or not beating up Roger Clemens, and I plan on heading to Cooperstown the day he's inducted. SS Jose Reyes - Have the Mets ever had a more electric player than Jose Reyes? With a resume just four years long, including time spent at second base, he's already 5th on the all time list of games played at Shortstop for the Mets. He's already got a chant, "Jose! Jose Jose Jose!," a cycle on his resume, a boatload of triples, and a hell of an arm. This guy is a star, and way more fun to watch than anyone I can think of. 1B Keith Hernandez - Mex should probably have his number retired by the Mets. He defined "clutch" and he was the on and off field leader of the 1986 Mets. Many people have called him one of the best fielders at first they've ever seen. I love listening to him as a broadcaster too. Despite all the accolades, and appearing on Seinfeld, perhaps my favorite TV show of all time, Carlos Delgado has a chance to supplant Keith at this spot, if he sticks around long enough. Utility: Carlos Baerga - I have to give Carlos a mention here. Maybe it was just because he has a funny name, or maybe it was his performances against the Yankees in the regular season Subway Series, but Baerga was a favorite of mine during his Mets tenure. When I look at his stats, I wonder if maybe I just loved him ironically? I don't know. When my friend dragged me to a WWE event at Madison Square Garden, though, I brought along a "Hogan Fears Baerga" sign. SP: ????? - Doc Gooden was my favorite Met during my younger years, even though he broke my heart several times as I grew older. He even threw a no-hitter for the Yankees, which probably should have put him on the banned list. But I admit I have a special spot for Dwight. Tom Seaver's autographed photo hangs in my office, but I have no memories of him playing. I did see Seaver get inducted into the Hall Of Fame, so that counts for something. Dave Mlicki beat the Yankees in the first regular season game they ever played against each other, so Mlicki will always have a spot in my personal Mets history book. Bobby Jones had that game against the Giants in the 2000 NLCS. Al Leiter left his heart out on the field, but he wrecked his Mets legacy by admitting he couldn't stay motivated and especially for joining the "evil empire" at the end of his career. Mike Hampton was great in 2000 but he also wrecked his legacy by trying to tell us he would send his kids to public school. Pedro Martinez is the most exciting pitcher the Mets have had since Dwight Gooden, but he hasn't been successful enough yet to call him my favorite. So, a team with an amazing pitching heritage has no one favorite for me. My favorite all time staff will stand at Seaver, Gooden, Martinez, Leiter and Mlicki until further notice. Closer: Randy Meyers - I was so angry when Randy K was traded. I had a cool poster in my room of Meyers wearing a Mets jersey, camo pants, baseballs as grenades, and other details I'm forgetting. This guy was cool. Even though he threw Gregg Jefferies under the bus, and had too much success for the Reds, and I probably wouldn't like him if I knew him personally, he was the only closer the Mets have ever had that I never vehemently hated at any time. Being a closer in New York is tough, but Meyers was a success. John Franco's career should be admired, even though he couldn't stand him at teh time Armando Benitez showed us how tough Franco was. Billy Wagner needs to be here longer before he can grab this spot. I know he lies awake at night hoping to be named my favorite Mets closer. Setup: Turk Wendell - What a character. Wearing animal teeth around his neck and slamming the rosin bag down - a more popular middle reliever the Mets will never have. Manager: Bobby Valentine: We share an initial, I met him twice, and I think he's a genius. I know he is hated by many, which only makes me like him more. Jon Heyman has a man crush on him too, so no matter how many stupid articles he writes, I can't ever get mad at him. I was even Bobby V one year for Halloween. Can you imagine me trying that down here in Greensboro? Valentine probably deserved to be fired when he was axed, but so did Steve Phillips. I like Willie Ball, but Bobby Valentine is perhaps the only ex-Met I could truly forgive if he ever took a job with the Yankees. I just pray that never happens! In a deal expected to be announced today, the New York Mets and Willie Randolph agreed in principle to a new three-year, $5.65-million contract that runs through 2009. Yesterday's back cover of Newsday headlined an article by Wallace Matthews in which Matthews chastised the lack of an extension for Randolph, stating there must be "some lingering doubt about Randolph's capabilities or some festering resentment about the way the season ended and who was to blame." Matthews accused the Mets of not being "able to find the time or the money to make a deal." He said that there could be "no other explanation." Well Wallace, I'm sure Minaya and the Wilpons feel really bad that it took one day longer than you thought necessary to come to terms on a contract. Willie's contract pays him an average of $1.9mm a year, nearly twice the annual salaries of "the likes of Ned Yost or Clint Hurdle or Eric Wedge," so now it is you who is looking bad. As Mike Lupica wrote in today's column, the Mets treated actually treated Willie really well, " they gave him a really good deal, and more job security than Torre has right now, about as much job security as anybody managing in the big leagues has right now." But don't go expecting apologies from Matthews or Newsday. 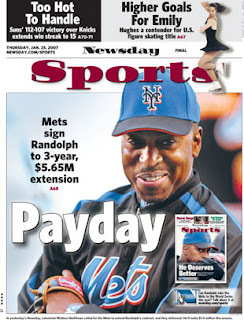 In fact, the caption below today's Newsday back cover headline says that "In yesterday's Newsday, Wallace Matthews called for the Mets to extend Randolph's contract, and they delivered." Can you believe they are actually trying to take credit for getting this deal done, a deal three months in the works? Give me a break! The Cliff Floyd Era is officially over. According to a Chicago Cubs press release, Cliff Floyd has agreed to a one year deal with his hometown club, the Cubbies. The deal includes a mutual option for 2008. The press release states that Floyd has a .974 fielding percentage and is one of just 15 active left-handed hitters to amass over 200 career long balls and 300 career doubles. Cliffy was a perfect fit for the Mets. A free agent signing in 2002, he had a great attitude and a terrific work ethic throughout his tenure. Unfortunately he just couldn't stay healthy as much as we all hoped. In four years with the Mets, Cliff batted .268 and slugged .478 with 81 homers and 273 RBIs in 468 games. His 34 homeruns in 2005 led the club, as did his 51 walks in 2003. I predict a nice, long standing ovation on May 14th when the Cubs come to Shea. Buzz: The Bloggers Are Angry! Eddie Kranepool Society: MY GOD! SPRING CAN’T GET HERE FAST ENOUGH! The Metropolitans: "Go to hell, gringos!" Mets Guy In Michigan: Ditch the black jerseys. It's the right thing to do. Can I just take a four week nap and wake up when LoDuca is breaking in a new mitt? According to ESPN, Carlos Delgado's wife is due with the couple's first child around April 1st, when the Mets are slated to open the 2007 season against the Cardinals, and Delgado will miss "a few games" when the baby is born. Here at Tales Of A Transplanted Mets Fan, we wish the couple a safe delivery of a healthy child - a couple weeks early! Former Mets pitching coach Vern Ruhle passed away at age 55 on Saturday, losing his battle with multiple myeloma. Ruhle served as pitching coach for the Mets in 2003, under Art Howe. According to wikipedia, multiple myeloma (also known as MM, myeloma, plasma cell myeloma, or as Kahler's disease) is a type of cancer of plasma cells which are immune system cells in bone marrow that produce antibodies. Its prognosis, despite therapy, is generally poor, and treatment may involve chemotherapy and stem cell transplant. It is part of the broad group of diseases called hematological malignancies. If you are an out-of-market fan of a baseball team, whether you're a transplant like me or just grew up rooting for a non-home team, you've had a few options for the past few years. MLB had a package called Extra Innings that gave you eight or so games a night around the country. Most cable networks offered this package for about $40 a month, as did DirecTV and Dish Network. But DirecTV is about to announce that they will be the exclusive provider of Extra Innings for the next seven years. They are paying Major league Baseball $700 million for the rights, and includes the development of a 24-hour baseball channel that will kick off in 2009. Thanks to MetsBlog and Hot Foot for the tip. Who this really screws over are people who live in condos or apartments whose leases prohibit the installation of satellite dishes.